Perfect for: Curious Explorers, Hippies, Bird Enthusiasts, Beach Bums. Vibes: Waking up with the roosters to the sunrise outside your window. Falling asleep to the soft calls of wildlife all around you. Colombian coffee with vanilla sunsets. Swinging in a hammock. Tingling from a day spent in the sun with a cool serene breeze on your skin. It is hard to do Playa Manglares justice solely with words and images. You realize how special this place is once you step out of the cab and get a warm embrace from your host Olga. The feeling you get when at a family cottage mixed with wild outback lodging in a remote untouched paradise describes Playa Manglares best. The Eco-lodge is located on a bay surrounded by mangrove and palm trees and full of wildlife. There are 3 floors with a different beautifully designed room on each floor. Small details like a hammock in the room overlooking the bay or intricately tiled outdoor shower amidst a lush jungle make Playa Manglares unforgettable. Perfect for: People looking to spiritually recharge. Wildlife lovers. Yogies. Vibes: Sustainability meets luxury. Staff that quickly become family. Whale sightings from your private beach. Untainted sand. Kayaking amongst the pelicans. Playa Viva is a boutique beachfront ecolodge, located on Mexico's Pacific side with Sierra Madre mountains as a backdrop. Enjoy the private stretch of beach, morning yoga, and the unique sustainable design. Choose one of 12 treehouses, eco casitas or suites - all open air and oceanfront. Wander the 200 acre property and discover an Aztec archeological site or a mangrove ecosystem - home to a variety of wildlife. The mix of public and private spaces help create the perfect vibe for meeting new people or finding yourself. Playa Viva runs on a 100% off-grid solar system and uses smart water conservation. The ecolodge also runs The Playa Viva Turtle Sanctuary, protecting turtles from predators and poachers. Perfect for: Vegans. Couples looking for serenity and peace. Vibes: Hammocks inside dense tree tops. Organic and handmade soaps in the bathroom. Tropical cottage. Enter the Mayan world of The Laguna Lodge by boat, through the legendary Lake Atitlan. The structure of the hotel is naturally integrated into a mountain, providing beautiful views of crystal blue water and three dormant volcanoes. All 6 suites are created from volcanic stone, adobe and palm and inspired by natural surroundings. Step out on your private patio to a garden of coffee and banana trees. Have a candle-light dinner while listening to the sweeping lake, creating surreal ambience. Warm up by the river stone and jasper fire place. Perfect for: Friends and lovers looking for an authentic Greek agricultural experience. Vibes: Picking olives to make your own olive oil. Pressing grapes to make your own wine. Sleeping under an almond tree. Eumelia Farm and Guesthouse is located in southern mainland Greece, near the village of Gouves. The agricultural paradise is surrounded by olive groves, almond trees, herb fields, vineyards and mountains. All cottages are built with eco-friendly materials in a traditional Greek farmhouse style and designed to maximize the natural experience. Choose between the Olive Tree House, the Vineyard House, the Lavender House, the Almond Tree House or the Sunflower House - all complete with private gardens and nothing but vast plains in your view. All water is recycled and all buildings are heated and cooled with geothermal power. Eumelia practices homeodynamic & biodynamic agriculture. Perfect for: Design lovers. Eco travellers. Lovers, families and friends looking for unique and remote corners of the world. Vibes: Sand dunes, cliffs and the sea. Wood and concrete accents. Outdoor showers. 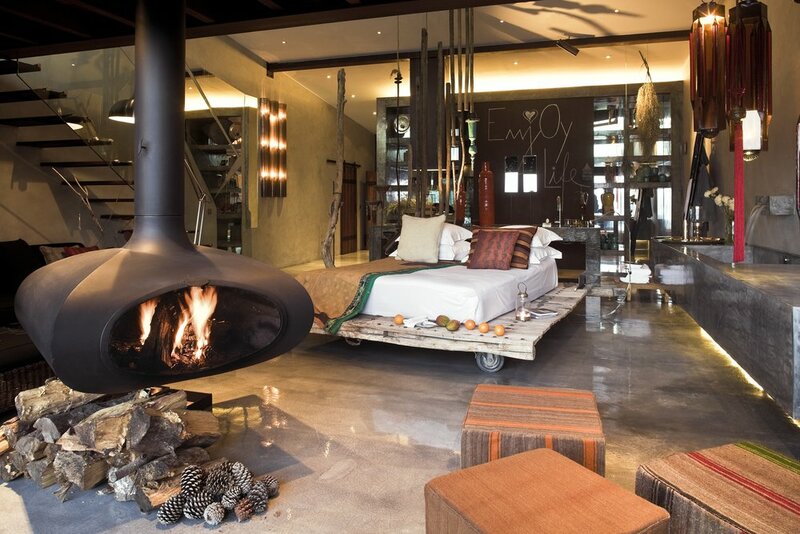 Custom fireplaces in every room. Private deck overlooking the Atlantic. The sounds of the waves. Savouring your time on earth.